The curtain is composed of 16 modules measuring 2 x 7 meters and captures and stores one kilogram of CO2 per day, the equivalent of 20 trees, according to an article on Bioplasticsnews.com. Each module works as a photobioreactor: a custom-made bioplastic container that uses daylight to feed the micro-algae and releases luminescent shades at night. 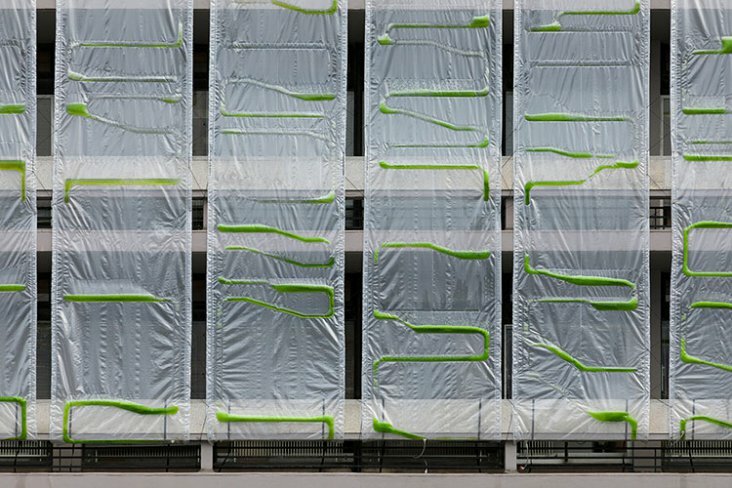 Air is introduced at the bottom of the façade, causing air bubbles to rise through the watery medium within the bioplastic. CO2 and other pollutants are captured and stored in the algae, and converted into biomass. The biomass can be harvested and used in the production of bioplastic, which is in turn used as the main building material of the photobioreactors themselves. The process culminates with freshly-filtered oxygen released from the top of each façade unit.